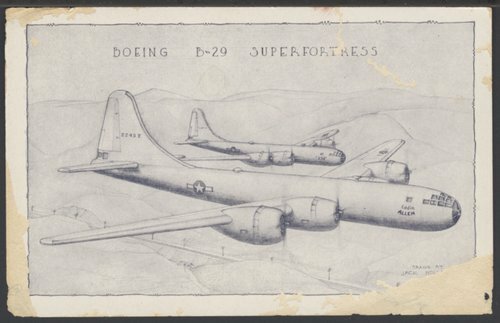 A postcard with a drawing of two Boeing B-29 Superfortresses built in Wichita, Kansas. The two planes were purchased in bond drives by Boeing employees. 'Eddie Allen', named for America's leading test pilot and aviation pioneer, and '293', named for the bomber lost in the first B-29 raid over Japan.